On 30th November Visualize was at the Wales Rally for the first public trial of the enhanced Visualize system. Spectators at major events such as motor rallies often miss seeing much of the action, since they can only watch a small part of the course at a time: now wireless technology is coming to their rescue. A high profile project - known as VISUALIZE - put wireless multimedia into the hands of spectators at the Wales Rally . The system allows spectators with PDA's to watch video coming live from cameras mounted in the rally cars as they race around the course. Getting a high quality video signal live from rally cars moving at speed over hilly terrain is a challenge; getting that video back out to spectators scattered around the course is equally difficult. Visualize provides a new service comprising live local video feeds, remote feeds from the Swansea Service Area, World Rally Championship statistics and results, and archive material, together with Team, Driver and Stage information, in the hospitality area at Walters Arena in the Rheola 2 stage at Wales Rally GB. Spectators access this service using wireless handheld devices connecting via wireless hotspots. The Visualise information is also displayed on a large screen at the event and is available interactively online to selected users. Spectators at many large-scale live events have a relatively poor experience, due to their location and the lack of personalized content, compared to armchair spectators who watch television or webcast coverage at home. Large-scale public events are now common-place. Examples include, motor sport (World Rally Competition, Formula 1), athletics competitions (Olympics), rock festivals (Glastonbury) and golf competitions (Open). Typically such events deploy a huge infrastructure of production and transmission equipment with many fixed and portable cameras. Most of the content is never made available to local spectators except through a single feed of edited output to portable TVs or large screen displays. VISUALIZE aims to provide an enhanced experience for spectators at events through local area access to a rich range of media via hand-held devices. This will include non-viewable (temporal or spatial) events or locations, archive material and statistics. For example, spectators at Formula 1 would be able to experience all key events (overtaking, pit stops, crashes, action replays) even when these occurred out of sight and would also be able to follow a team or individual's performance. · Video compression and streaming technology for use with wireless broadband networks in difficult environments. · The integration of fixed (service park and trackside) and mobile (in-car) cameras into a live-viewing infrastructure. · Rapid planning and deployment of networks through the exploitation of advanced propagation modeling tools. · Content management, distribution and integration with the existing broadcast infrastructure. 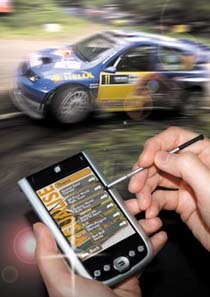 · A demonstrator hosted by ISC (International Sportsworld Communicators) at the UK stages of the 2006 and 2007 World Rally Championship. 3C Research supports collaborative research projects involving universities and commercial organizations, both large and small, in the fields of digital media and communications. 3CR creates an environment where a wide variety of industry players come together to share their perspectives and skills in order to understand emerging markets and to create and realize new solutions. Partners in the VISUALIZE project, which is supported by the DTI Technology Program, are Provision Communications, Turner Broadcasting, BT, Node, Inmarsat, U4EA Technologies, Util4, and the University of Bristol.